Barcellona is one of the best cities of Spain. It is the capital city of the community of Catalonia and it estimates about more than a million of citizens. It is located in eastern Spain, on the Mediterranean Sea and in the south of the Pyrenees mountain range. Barcelona has a Mediterranean climate with some different features from those typical of the Mediterranean climate. In fact, sometimes there is a large amount of rain in summer. Why? 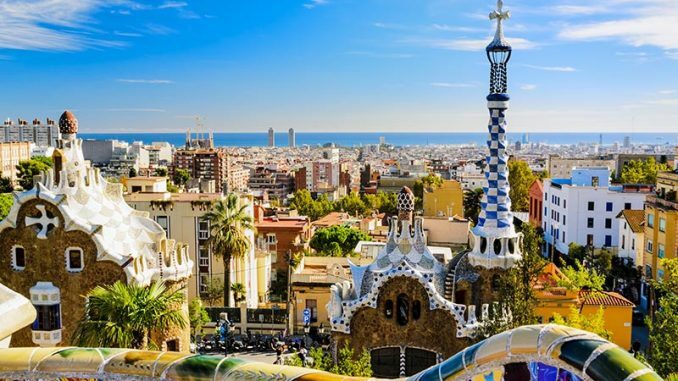 This is possible because the classic Mediterranean climate in Barcellona (and in the region of Catalonia in general) with mild winters and humid and dry summers is influenced by its position in the north of the Western Mediterranean. However, as the majority of the Mediterranean countries, January and February are the coldest months while July and August are the warmest. The position of Barcelona between the “Serra de Collserola” and the Mediterranean Sea allows low daily temperature ranges: accordingly, it is rare to have extreme temperature. But this changes once uptown and townships close to prelitoranee valleys. In Barcellona there are several buildings that have been recognized by the world heritage of UNESCO. Walking in the streets of Barcellona you have the possibility to find many sources of its long history, from the Roman ruins and the medieval city up to the neighborhoods of Catalan modernism, for instance the works of Antoni Gaudí an architect from Catalonia, Spain, who belonged to the Art Nouveau (Modernism). Thanks to its unique style, he created several wonderful buildings that attracts tourists every year from all over the world. Among his main works we have to mention the “Sagrada Familia“, whose full name in Catalan is “Expiatori de la Sagrada Familia“. However this building his still under construction since 1882 because Gaudí left it largely incomplete. Thanks to the modern materials, the “Sagrada Familia” will probably completed in 2020. This is possible thanks to the money earned with the entrance tickets and the offers of the faithful. Furthermore, Gaudí also created Park Güell, “La Pedrera” and other important buildings. Among the main places of attraction we have to remember La Rambla (in Catalan) or Las Ramblas (in Spanish), which is an avenue located between Plaça de Catalunya (the center of the modern city) and the Old Port. During the day (and also in the night) the road is always full of people, presenting a large variety of restaurants, bar, shops, florists and so on. While, near the port you can see many artists and painters. The Ramblas end coming to the Old Port, where the statue of Christopher Columbus is situated. It is a very particular statue because he metaphorically indicates the direction of the New Continent. A few steps from there, you can see the Maritime Museum dedicated mainly to naval history of the Mediterranean Sea. And did you know? The Museum is located in the medieval shipyards, where were built the boats that sailed for the Mediterranean, and its stone buildings are an example of industrial archeology. Moreover, the Old Port offers the largest aquarium of the Mediterranean marine life. One of streets situated near Las Ramblas will bring you to Plaça Reial, an important square with palm trees and buildings and places where you can taste many typical dishes of the Spanish cuisine. The cuisine in Barcellona is very full of delicious dishes. 1) Paella. Even if this dish is typical of the Valencian cuisine we have to mention it because Paella is diffused in whole Spain country and in Barcellona there is the preparation of this specialty in different ways. 2) Pa amb tomaquet, which is bread with tomato. It is a simple dish but at the same time it is considered a must in the Catalan Mediterranean cuisine. 4) Coca. It is one of the most famous street food. It consists of a flatbread filled with roasted eggplants and peppers, which are cut into strips. In addition, they are flavored with oil, salt and garlic. 5) Tortilla de patatas. If you think that it is a simple omelet with potatoes you’re wrong. In fact potatoes suffer a previous preparation: they should be cooked in the oil and then soak in beaten eggs. When they reach the right consistence, it is possible to make the final baking. 6) Crema Catalana. It is one of the most famous Catalan desserts. It is characterized by a creamy base, topped with a crusty surface made of caramelized sugar. 7) Pollo asado a la Catalana. It consists of roasted chicken served with dried fruit. 8) Botifarra, which is a type of tasty sausages. 9)Esqueixada de bacalà. It is a cold salad with cod. All is accompained by red peppers, olives, oil, tomato, onions and vinegar. 10) Canelons. They’re similar to “cannelloni” (a typical Italian dish) filled with different types of meat. The city of Barcelona has an extensive network of subway lines such as the Barcelona metro, which reaches much of the city area and some of the surrounding municipalities. There are also two main rail networks: “Rodalies de Catalunya” service and “Ferrocarrils de la Generalitat de Catalunya“. Buses are very efficient and they have equal rates, having the possibility to use the entire network for a limited time by paying a single ticket. Despite the importance of buses and tourist buses, one of the symbol of this city is the taxi (black with yellow doors), thanks to its low prices in contrast to many other European cities. It is very suitable for transportation from the airport to the city and it is possible to book it in advance, choosing the type of taxi that you prefer (in terms of number of people, child seats or special needs for disabled people). Bikes are very diffused, and you can enjoy them also in winters thanks to the mild climate that Barcellona offers. The benefits of using Coconut Oil.